What Type Of Water Is Best For Drinking - Here's The Truth! The type of water to drink has long been a controversial topic. Understand Nature and make your own informed decision of what you think is best. What Type Of Water Is Best For Drinking? What type of water to drink is a controversial topic. Everybody has their own theory on what’s the best type of water to drink. Don’t even talk to water processing machine sellers, they will just get you more confused! At the end of the day, the one who drinks the “best” water may still get diseased, while the one who drinks tap water may live to a hundred. Read the book “Water Can Undermine Your Health” by Dr Norman W. Walker. Is Ionized Alkaline Water Really That Good? Many people seem to think that ionized alkaline water is the best. No doubt our body needs to be more alkaline than acidic, but alkalinity of the blood is best being hydrated by eating/drinking “alkaline-forming” foods. There is alkaline water, and there are alkaline-forming foods. They’re different. Our digestive system needs to be acidic, but drinking alkaline water neutralizes the acidity in the stomach, not helping with digestion. This may cause digestive problems and can be dangerous in the long run. More on that later. On the other hand, fresh juices provide all the alkaline-forming minerals (e.g. potassium, calcium, magnesium, manganese and iron) that convert blood acidity into alkalinity. When in doubt, always look to nature. Look back to the time of the cavemen. They never had an ionizer to ionize and alkalize their water. Nor any other water processor for that matter. But they had nature that provided them with fresh fruits and vegetables for hydration. Likewise with the argument about drinking distilled water. Again, look to Nature. The process of rain water is one of condensation/distillation. 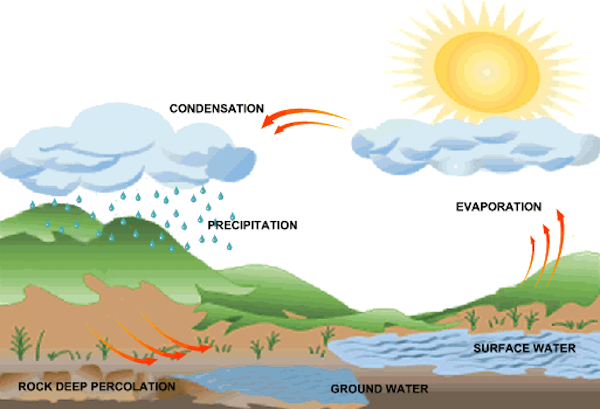 Water is being evaporated into the sky, forming clouds and they fall back to earth as rain water to water the earth. This is the type of water we drink, distilled water—water in its purest form. One may argue that spring water flows out of the ground, so that’s Nature and we should be drinking spring water. Yes, that’s Nature but the origin was still from condensed water from the clouds. Spring water is distilled water absorbing the minerals of the soil that goes into nourishing plants that we eat. So, depending on where you are, you get hard or soft water. Ditto with mountain or stream water. There may be minerals in these waters, but they are not made bio-available to our body. For example, ground water from a land that is rich in calcium can cause calcification in your body (think kidney stones, bone spurs and other growths). Rain water is supposed to be the best drinking water. Think cavemen’s time when there was no pollution, that would be the purest form of drinking water. Due to the air pollution in our modern world, a distiller is invented by those who understand the concept of drinking distilled water. Pure distilled water has a neutral pH, thus it has nothing to influence the pH change in either direction. When you drink distilled water, it adjusts to your digestive enzymes’ acidity, instead of your body adjusting to it. The pH level of distilled water is 7.0 because it’s neutral. There are websites selling alkaline ionizers that claim that distilled water can turn acidic by absorbing carbon dioxide from the air. Not true! The air is composed of 78.9% nitrogen, 20.95% oxygen, 0.93% argon and only a very small 0.038% carbon dioxide and the rest are the other minor elements. These elements have no pH value to them, so we cannot say that these gases would turn the water acidic. I want to reiterate the danger of drinking alkaline water. I see many of my clients receive healing through drinking many quarts (liters) of fresh fruit/vegetable juices daily through juice fasting/feasting. On the other hand, there are a few who reported being severely sick after drinking many gallons of alkaline water. This is an alkalosis condition. Note that ionized alkaline water often measures about 9-10 on the pH value chart which is highly alkaline. 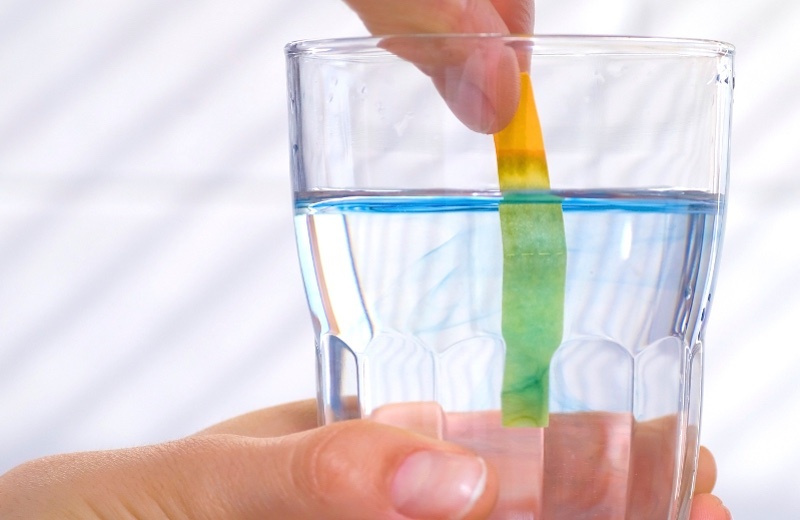 A person who drinks alkaline water may initially see an improvement in his/her health—this is due to hydration. However, after some time, this supposedly “healthy water” may backfire. Our digestive system produces gastric juices that are very acidic. Every time you drink alkalized water, your digestive system has to produce more and more acid to compensate for the dilution of gastric juices. After some time, this over-production of acidic enzymes can create an abnormal digestive condition. Some of the symptoms of alkalosis are: bleeding gums, diarrhea, stomach cramps, vomiting and severe headache. In severe cases, brain chemistry is altered that leads to confusion, disorientation, hand tremor and muscles twitching. You don’t have to trust me, nor agree with me. Do your own research, think logically, and make your own informed decision about what’s best for you. Also read: How much water should you drink a day? Of course, there are so many contaminants in our water, like industrial chemicals, heavy metals, viruses and bacteria. I think distilled water is perfect. I have a wisewater wise 9000 water distiller. Every morning, I use it to make distilled water to drink. I like drinking pure water.